I recently came across the website Modern Map Art and was blown away by the idea of their products. I knew as soon as I saw their Custom Star Maps that I had to check them out. Now Modern Map Art has a number of products available and I recommend that you check them all out as they all look amazing and intriguing. Modern Map Art takes your favorite cities, mountains, and places and turns them into beautiful works of art. If you’re looking for the perfect way to remember that trip to Europe, honeymoon, place you got engaged, your alma mater, hometown, or anything else, our maps are a great way to display that nostalgia in your home. They make great gifts, too! What we checked out was a Custom Star Map. 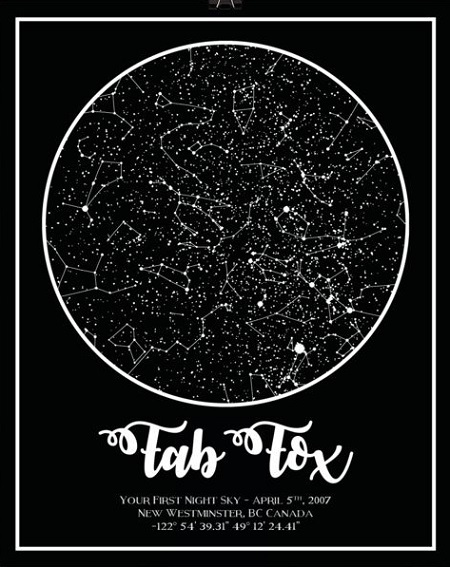 You can have your Custom Star Map show the night sky of a special moment in your life. For me, I knew right away that I wanted the night sky of the day my Little One was born. Simply select the style of your poster, size, and color, then enter all of your information in the text boxes, and click Order. Once we receive your order, we will create a personalized poster just for you! You’ll receive a proof within 72 hours, and then once the proof is approved, we’ll begin printing and shipping your item. It’s that easy! You can go HERE to play around with all the options and see how you would make your Custom Star Map. When you order, you decide between a Poster, Framed Poster, or Canvas. I chose the Poster. When the Poster arrived, it arrived in a poster tube so I unrolled it and set something on it to get it flat after its travels in the poster tube. I still have to go buy the perfect frame for it at our local store. Once it is framed it will be on the wall beside my Little One’s birth photo. Shipping is free in the US for Modern Map Art products, but since I am located in Canada, I decided on the poster and getting my own frame. There are numerous choices for size of the product as well. I chose a nice 8 x 10 as I knew it would fit perfectly alongside the other image I want it on the wall with. The sizes go all the way up to 24 x 36. The creating process is easy, but it took me some time because there are a ton of options and I wanted my Custom Star Map poster just right. I think it looks absolutely amazing. My Little One also thought it was super neat to see the night sky the day she was born. Modern Map Art is perfect for buying for yourself to remember your important dates and events, or as a gift for various occasions. Modern Map Art and their Custom Star Maps were even featured as a great gift item on The Today Show.